Brisant Secure is celebrating receiving a Sold Secure certification on its Lock Lock security handle. The company says it is now listed on www.soldsecure.com as the only entrance door handle to achieve this certification and door manufacturers, installers and homeowners can be re-assured that the product has been tested to the highest standards, along with the 200,000 cycle and 5,000+ hours salt spray testing credentials. And keeping with security, trade fabricator Universal Trade Frames has introduced a new 7-point security locking system to its door products as standard. The Elite Security 2 hook, 4 roller lock is a high security extending door lock which has been designed to meet the requirements of PAS 24 and Document Q. Elsewhere, colour comes into the spotlight with news of South Wales based windows and door fabricator GRM, who are one of the few REHAU sole accredited Acryl II colour coating system specialists and an active user of REHAU’s laminate foils collection; plus a letter from Deceuninck UK and Ireland MD, Rob McGlennon, where he expects colour to account for 60% of the company’s window sales by the end of the year. Also, FENSA and CORGI Fenestration set out their respective stalls in the installer scheme stakes; and specialist distributor of window controls, openers and actuators, Teal Products, has launched a brand-new, intelligent chain actuator. 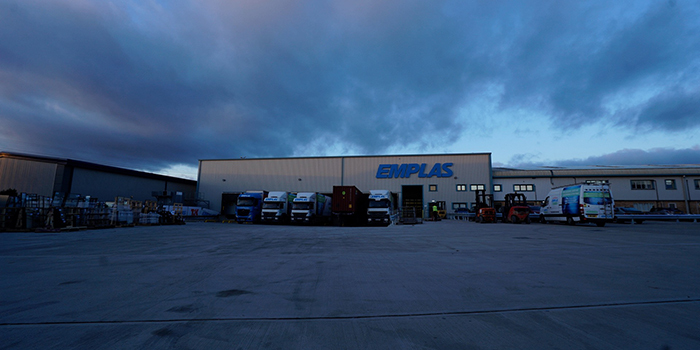 Pictured Above: Emplas will celebrate its 40th year in business this year read more here. Brisant Secure says its Lock Lock is the only security door handle with the coveted Sold Secure certification, that’s issued by the Master Locksmiths Association (MLA). FENSA has revealed some of its aims for 2018 as the company plans to build on its market position as the scheme of choice for installation companies in the domestic glazing sector. The window industry is no stranger to hype, but I don’t think I’ve seen a stronger trend than the current swing to colour. We anticipated the trend, and invested in manufacturing, logistics and marketing so Deceuninck fabricators and installers could sell colour with confidence. We aimed to be 100% ‘colour enabled’ and ahead of trend so we wouldn’t hold them back, no matter how strong the demand. Emplas will celebrate its 40th year in business this year, while looking forward to continuing growth and investment in 2018. Emplas was founded by current Chairman, Kevin Johnson. Its’ initial focus on retail, trading as T&K, switching focus to specialism in trade fabrication in 1985. Customers of Rapierstar are benefiting from its latest investment in logistics and supply chain technology as it reports a near perfect record in on time in full (OTIF) deliveries over the last 12 months. Teal Products, a leading specialist distributor of window controls, openers and actuators has introduced yet another new product innovation to its line-up. Fresh from adding WindowMaster’s new folding arm actuator, the Gloucestershire-firm has launched a brand-new, intelligent chain actuator. A new online resource from ISO CHEMIE provides improved access to a range of sealant tape related project services and special tools for fenestration installers, retailers, designers and architects. Roseview’s Ultimate Rose has helped installer Truro Windows give a stylish Cornish property an outstandingly authentic facelift. The Window Depot has had a new responsive trade website designed and developed by the Spectus marketing team. The website was part of the bespoke support package The Window Depot has with Spectus and has been developed to appeal to trade audiences. Quest has successfully renewed its ISO 9001:2015 certification. Aluminium glazing specialists Bennett Architectural have been chosen to work on the NEXT store at Selly Oak’s brand-new Retail Park. The project which encompasses 250,000 square feet, will also host various retail outlets including Sainsburys and Marks & Spencer as well as student accommodation. Experienced Sales Manager required to deliver product and knowledge training to national accounts. Maximise profitable sales for a growing business delivering quality products for the building sector. In the space of just six months since its launch, Virtu-AL – the aluminium textured, non-woodgrain finish composite door – has already topped the bill as one of the homeowner’s favourites. At the end of last year, Epwin Window Systems commissioned a piece of research to find out the top goals of fabricators and installers in 2018.
aluplast will showcase its highly innovative and ultra-thermally efficient Lift-and-Slide Patio door, at Fensterbau 21 – 24 March Nuremberg, Germany. PIGS, the best networking event for the glazing industry is returning to Manchester for the first 2018 event on Thursday 1 March.